On Saturday Sept. 1, 2018 we hosted one of the largest automotive events in Western New York. 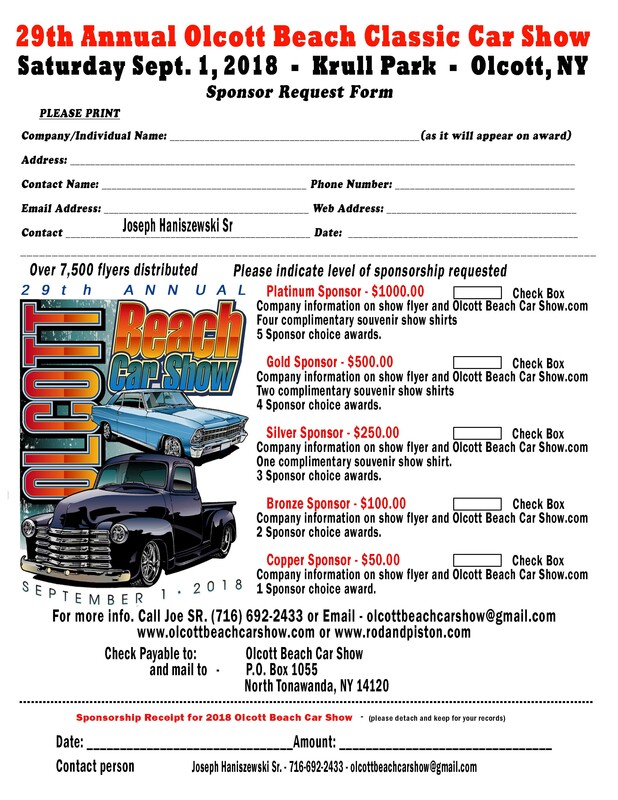 This is your chance to showcase your business by becoming a sponsor of the 29th Annual Olcott Beach Car Show. The show, which is located on the edge of Lake Ontario in a wooded park, is considered by most enthusiasts to be “The” car show in NYS. Antique, classic and show cars from as many as five states and all over Western New York and Southern Ontario will be on display. Over the past few years, the show has grown significantly with more participants, spectators and vendors. The number of cars has grown from a couple hundred to over 1000, and the number of spectators numbers in the thousands as well. By participating in the largest car show in Western New York, you also help us in supporting our charity, the Ronald McDonald House of Buffalo. A guest room at the RMH is decorated with a classic car theme. Your company name will appear on event flyers. Repeated mention of your company name over the public address throughout the event. Sponsor's Choice award with your company's name during the awards ceremony.